With freezing rain and sleet possible today, it's a good day to be sitting and concentrating at the drawing board. Before today's work begins, wanted to post yesterday afternoon's bit of work. This is the stuff that gets me going . . . . . . texture, texture, texture! One upon the other upon some more. In the end, this windfall of textures is what drew me to make note of this reference material in the first place and which now, has pulled me into all the possibilities of using this as the setting for the current work. I've sort of taken a break from doing some smaller scale works for posting to ebay, though there are plenty waiting in the wings for posting over the next several weeks so don't take that to mean that I am moving away from posting to ebay, and have begun a larger work (it will wind up being 10" x 14") which I have worked on for about eight hours already. Does not look like much accomplishment, I know. This one is going to be quite 'noodly' as I am fond of saying when working on a piece that is chock full of little details. And this one is certainly full of noodles! I ask myself sometimes, as I have been into a work for a day or so, 'What every possessed you to pick such reference to work with?' I think I hit that point when I sat down to work today! What you see so far is just the tip of the iceberg. 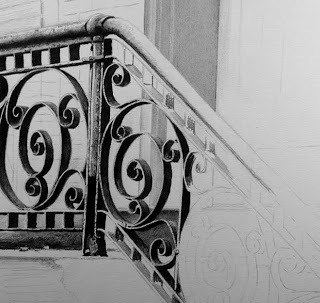 There is a lot more of that railing to come. 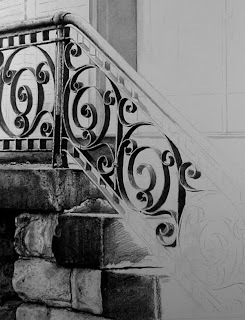 Well, it is a challenge for sure and the fact that this material is the sort of stuff I have not worked into a drawing in a bit, makes it fresh for me. I know I've said before that challenges, especially like working on textures I don't do that often, or working with subjects that I am not that familiar with, can give me pause when considering a new work. But then again, how do you grow as an artist if you don't challenge yourself every now and again? The reference for this work has been sitting around for well over a year. I have looked at it now and again and scratched my head and wondered how I might ever make use of it; what subject might work well within the context of the image or what sort of idea or emotion would I like to evoke? In this particular instance, by focusing in on just a small portion of the overall photo image and editing out some unnecessary details that would take away from what will be the overall thrust of the whole composition when completed, and finding the absolute perfect, emotive subject matter to have as a major point of interest, I have finally found a way to make use of material that, when I was there and photographing and making notations as to light and such, I knew instinctively would offer me a really good starting point sometime in the future. It's good to stash ideas away and let time work its magic. I remember a comment that John Sharp, the marvelous wood sculptor, had said during his talk on being an artist when he received the Master recognition at the Birds in Art opening weekend several years ago. John spoke about his stash of wood chunks, logs and stumps and how it took time for him to 'see' what was there in the wood. Sometimes he would look at a piece of wood for years before finally the idea was revealed to him by the wood itself. I remember at the time taking to heart his statement about how he let the wood show the way. Like many of my artist friends, I have discs full of reference material, some of it from as long ago as ten years or more. From time to time I just sit and spend some time wondering through a disc full of images and as often will happen, something just jumps out at me in an instant and I know there is something, finally, that will spark an idea. It then goes into a special folder on my computer which I call 'Working Ideas'. I won't tell you now just how many images are sitting there and awaiting refining and editing and careful study, but all of those set aside images will ultimately find their way into compositional arrangements for future works. Surely more currently gathered reference material always sits at the forefront of my mind when considering ideas for a new work or two. But I never overlook images shot a year ago or two years ago or ten years ago. There was a reason, at the time, that sparked my need to capture that moment, that view, that light, that way things were arranged and as in this instance, there may come that perfect moment when, as Master sculptor Sharp said, it just reaches out and grabs hold of you. I hope all those who look in on this blog enjoyed their Christmas. I will be posting two new works to ebay this evening, shortly after the two that close tonight, close bids. Check back after 8 PM (Eastern) to see what little goodies I will have up next. As noted, here are the next two small works up for bid on ebay. 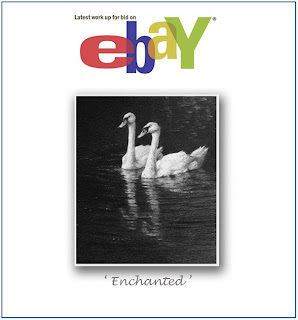 Click here to place a bid on 'Enchanted'. 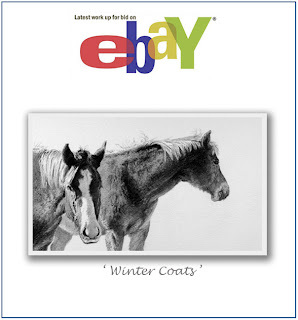 Click here to place a bid on 'Winter Coats'. 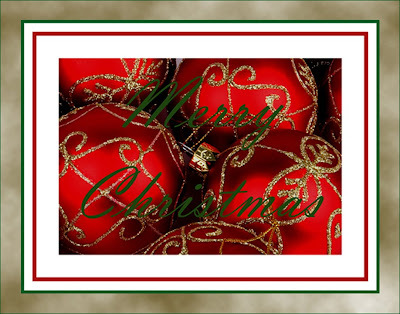 OK, I know it's only Christmas Eve but don't think it too early to wish everyone a . . . . . Here are the next two works being posted to ebay for bidding. Good Luck! 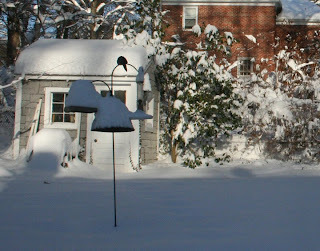 A record snowfall for the month of December here, outside Washington, DC! 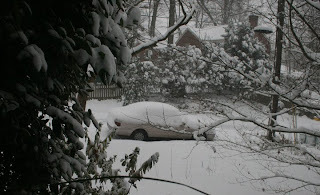 Momentarily, I will trudge out the front door and begin shoveling out. 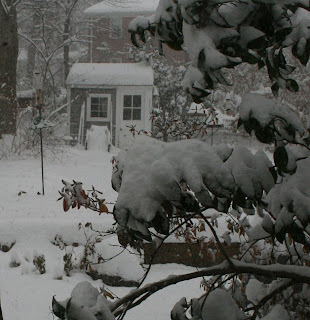 I know, to those of you who look in from the upper Midwest, or mountain states, you must be having a chuckle at how we mid Atlantic dwellers are all hyped up about the snow. 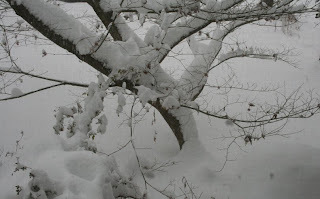 But, this is the most snow I have seen in five or six years and not something typical in the recent past. Delightful yes, and I am glad I don't have to go out of the house to work come tomorrow morning! And a reminder that tonight I will be posting one or two more new small scale works to ebay so check back later this evening to see what I shall be offering for this coming week. 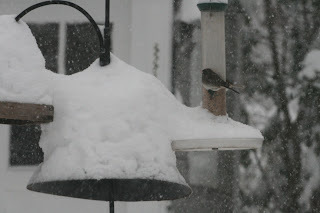 Enjoying this quiet morning, no sounds outside as the snow continues to pile up. 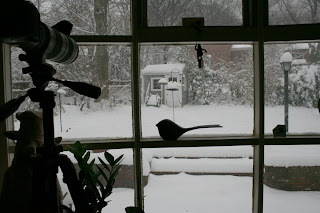 What a great day to be inside, watching from the coziness of the studio. I imagine something cold and wintery developing on the drawing board today! 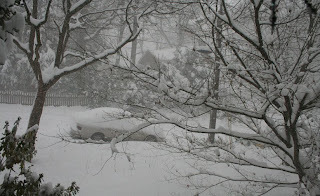 (posting at 1:30 PM) Been snowing for about 15 hours now with no signs of letting up. Lunch break, time for peanut butter and jelly and a nice hot cup of tea. 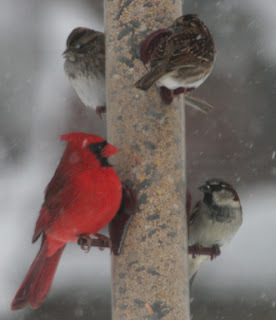 Sitting at the kitchen table and watching the birds at the feeders in the back yard. Glad I filled them the other day. It truly is becoming a Winter Wonderland out there! As noted yesterday afternoon, I completed this little work about twenty minutes ago. This one weighs in at 3 1/4" x 3 3/4". Look for it to be posted for bidding on ebay this weekend. 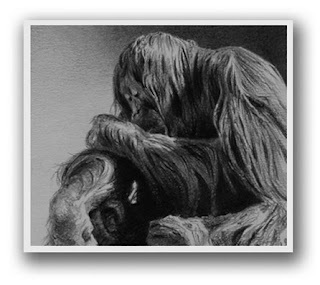 Later this evening, I will be posting another new work, subject . . . well best kept a surprise for right now! So, come back around 8 tonight! OK, I have just posted (at 8 PM) the next small work up for bid on ebay. If you would like to place a bid on 'Fred and Ginger', click here . I've just, well about twenty minutes ago, completed the next small work that is going to be posted on ebay tomorrow evening for bidding. Not going to give away what it is just now, so you will have to come back tomorrow evening to see! As there is still some studio time available to me this afternoon before I have to do a few things before dinner time, I wanted to post what will become another small work for ebay. This is actually the first ten minutes of work on this one. 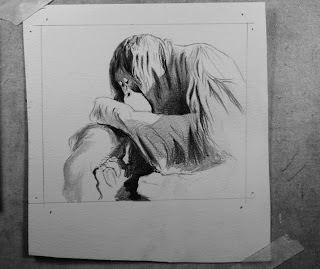 What I am doing now is just blocking in tonal values and establishing 'break points' where light meets dark, bright meets shadow and trying to set in some lines of reference for the long and flowing hair as well as establishing some mid tones of grey to try and start modeling the animal, giving dimension to it. Anyway, I thought it would be fun to post this ten minute study so far. I would come back to it after dinner time but this evening is a broadcast from the Met of one of my favorite operas, Tosca, and that is not going to be missed! This little work, about 3" x 4", will have to wait till morning for finishing up. 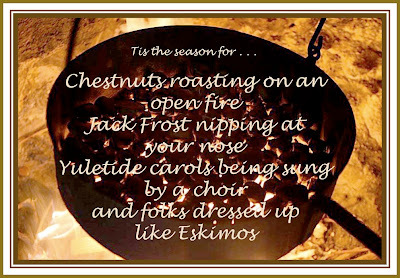 Well, no roasting chestnuts here, no nipped noses, no carols being sung and certainly no Eskimos wandering about. But, later on this evening, I will be posting a new work to ebay for bid. That should be around 8 PM (Eastern) or so; you might want to check back and take a look at the latest little work, then. The two currently listed works will be closing on Thursday evening and I will be posting one more work at that time with all of the new pieces to close bid on Sunday evening this weekend. If you would like to see the new work just posted (at 8 PM) to ebay, then simply click here and take a look, make a bid, good luck! Here's a sneak peek at a little bit of the new work! 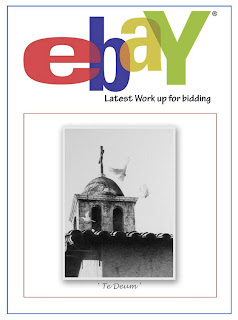 Here's a little twist on the ebay thing . . . I've posted two more small scale works for bid but if you want to know what they are, you'll have to click on the links below to take a look. Click here to see the first of the pieces and to place your bid. Or, click here to see the other new work and make a bid on that one! 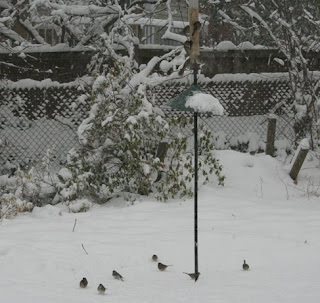 You know it's winter when the birds start congregating around the feeders. 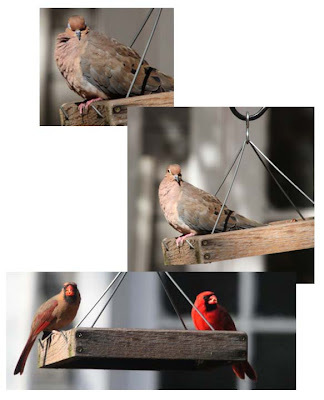 After refilling the other day, the neighborhood cardinal pair flew in and then the ever present mourning doves arrived. A late afternoon few minutes of bird joy. I may have found some inspiration for one of my Birds in Art submissions for next year. Never too early to start thinking about that deadline. The past weekend, Germanton Gallery's 17th Annual Miniature Show opened in North Carolina. 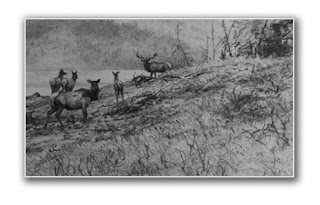 They have set up pages on their web site showing all the available works, including four of mine. Click here to go to the site and take a look. The show will run through January 1 and you can call the gallery if interested in any of the works. As promised, here are the first two works being posted to ebay for bidding. These auctions will run for a week. Good luck! 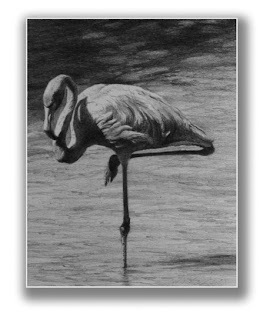 Click here to place your bid on 'Flamingo Grace #2'. Click here to place a bid on 'Misty'. Not quite a winter wonderland, yet . . . but snow nevertheless. The weather guys were right for a change. 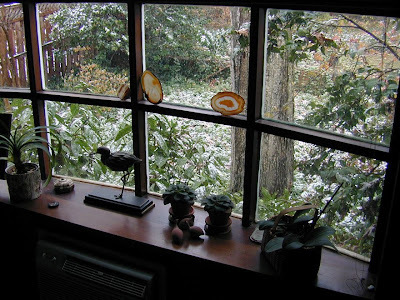 That wonderful bronze avocet sitting on the sill is by my sculptor friend, Pete Zaluzec; one of my favorite pieces of sculpture in my small collection of artist trades. The little cluster of clay guinea fowl were picked up near Victoria Falls in Zimbabwe ten years ago. 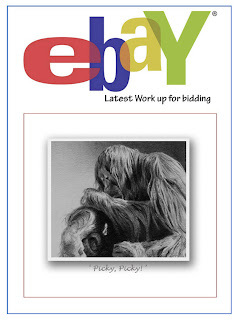 The first little ebay work will be posted tomorrow evening, so come back then! Just a quick update on last Friday's posting . . . I will be posting the first small work for bidding on ebay either tomorrow or Sunday, so please check it out this weekend. 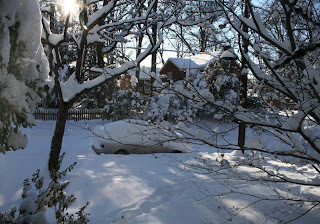 We are expecting our first snowfall tomorrow here in the DC area. Remains to be seen if it will happen, and how much. Shovel at the ready, just in case! Ah Winter!